No this isn’t science fiction. 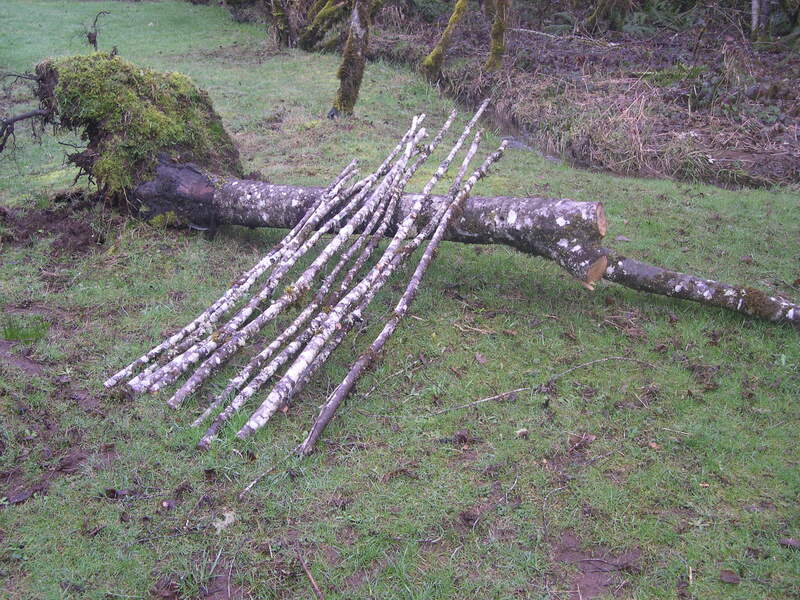 I’m inoculating fallen wood from winter storms. Waste not-want not! Here on our hobby farm everything is used to grow food. Some of this wood will be used for bean poles and a spirit house I am going to build for our woods unseen beings. Offerings of food will be given in gratitude of protection and friendship. By using the dowels to inoculate cut hardwood logs or stumps, mushroom mycelium can be encouraged to grow throughout or colonize the wood. Once the wood is fully colonized (typically 9-12 months) mushrooms will spring forth from cracks or channels in the wood. 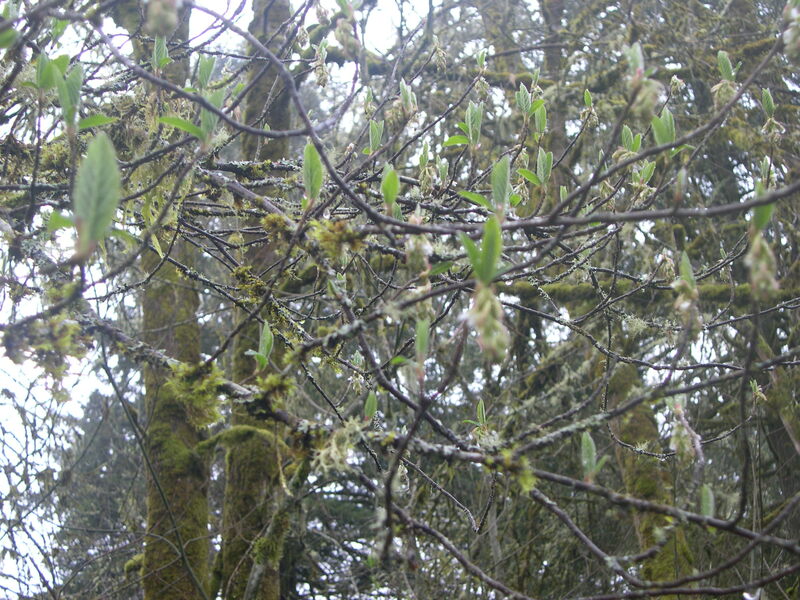 Generally, the best time of year to inoculate logs and stumps is in the Spring, after your last hard frost. However, you can inoculate your logs any time up to 30-45 days before consistently (i.e. ’round the clock) freezing temperatures set in for the Winter. The idea is to allow the mushroom mycelium growing on the Plug Spawn time to establish itself in its new home before it goes into dormancy over the Winter. 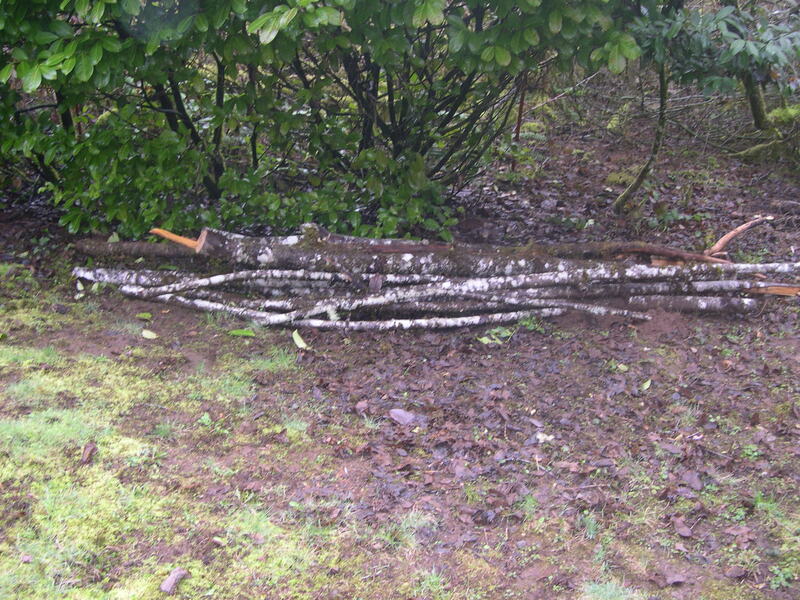 Logs can be left outdoors over the Winter, under a layer of straw or a burlap tarp, shade cloth or other vapor-permeable cover (do not use plastic tarps: this can cause mold to form). In areas where the Winter is exceptionally harsh, logs can be stored in a shed, barn, garage or other outbuilding. Harvested tree fall for growing mushrooms and building a spirit house log house for the unseen beings that live in our woods. 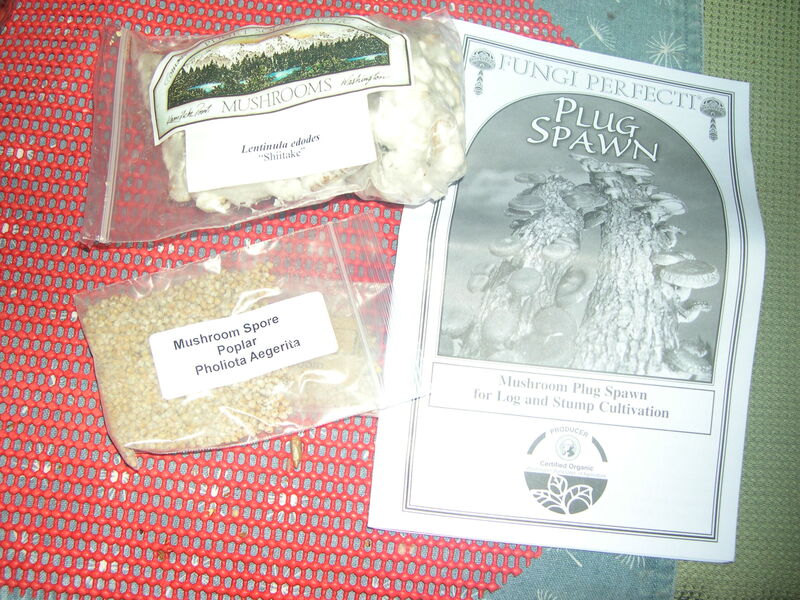 Poplar Mushroom Spoor and Shiitake spoor blugs. Stump will be used for mushrooms. Rolling it into the woods today. Some bean and pea poles harvested as well. Free food and wood! I’ve been using food grade Diatomaceous earth to keep pests out of my garden and worm my chickens. Bugs, worms, beetles, and slugs hate the stuff, it plugs up their lungs and scratches the heck out of their tender parts. During research I found humans can consume De as well. I use it as a preventative for pin worms for my chickens, I also add a cup every month to their dust baths. I take a teaspoon a day, add a couple teaspoons to my 11 chickens feed, and give Mina an egg with a teaspoon of DE as well. There are other health benefits which you can find in this article. (NaturalNews) Few people give much thought to lowly diatoms, single-celled marine micro-organisms that are found in abundance in large bodies of water. However, when these tiny organisms die, their skeletal remains settle to the bottom, become fossilized over time and accumulate to produce one of nature’s most beneficial and healthful substances: diatomaceous earth. Diatomaceous earth is often harvested from areas where large bodies of water once stood and is marketed in two grades – industrial and food grade. Industrial grade diatomaceous earth is used for many purposes including water filtration systems in swimming pools. Food grade diatomaceous earth is perhaps best known for its use as a non-toxic insecticide. However, food grade diatomaceous earth offers a host of health benefits too.